This teaching tonight is an answer from the Lord on how to hear and see Him. He has led me into that place where I can see and hear Him, receive counsel and to receive teachings from Him. First of all I want to say we have to want Him with all of our hearts. Our very top priority is to have a really, truly, deep relationship with the Lord. As the Scripture says, "You will call upon me and come pray to Me and I will listen to you. You will seek Me and find Me when you search for Me with all your heart. I will be found by you declares the Lord and I will restore you (Jeremiah 29:13)." This is an intimate love relationship. It must be nourished with quality time, sacrifice, and priority. No man wants to be the last on the woman's to do list. In fact, He doesn't want to be on any list. He wants our whole attention distracted by Him when we are sensibly together. This is a grace. All we have to do is ask for it and make time for it, nourish and protect it when it's given. He doesn't want my leftovers - He wants my prime time. It's all I want as well. When I got my life in God order, I put Him in the center and arranged all other activities around Him; church, videos, conferences, all the things we consider strengthening had to take a back seat to have time with Him. I started getting less and less out of church and more out of my time with Him. When we go to a conference, we can learn a few things out of a conference and perhaps get prayer. But when we go to the Lord personally, He addresses things directly. We don't have to wait through hours and hours of lectures. He addresses the important things directly and heals us on the spot. There's a huge difference there. When I fail to show up for prayer or I cut it short, I feel like I've stood Him up and I know it hurts Him. He knows that I love the "nothings" in my life more than I love Him, or I wouldn't have allowed that to happen. It hurts Him to see me dedicating 16 hours of my day to work and my last 45 minutes to Him. That's when I'm dead dog tired. We wouldn't save that time for anyone. That's time when you get ready for bed or do the dishes; doing something mindless. That's certainly not the time we'd want to spend with the Love of our life. When I finally got sick and tired of my merry-go-round life I forcefully and deliberately put a stop to everything that was interfering with that time with Him. Here are the things that helped me immensely. Here are the things the Holy Spirit helped me to see that have helped me in my life and that always brought me the comfort of His sensible presence. We can know He is present in many different ways, we can sense His presence. When I say sensible I mean seeing Him in the spirit and talking to Him and getting an answer back. There's a real dialogue going on. The first thing you want to do is set the scene. Take control of your time and space and make sure it's protected. This is the Man you're marrying for all eternity. You're going to share feelings and plans. You are both going to be strengthened and nourished in one another's company. Yes, you heard me right: you're going to be strengthened, both of you, and nourished in one another's company. How do you nourish and strengthen the Lord of Glory? That's a good question. If you remember, the angels were sent to Him in the garden to strengthen Him for the passion. He relives that passion everyday in times when He sees children murdered in their mother's womb, a man sleeping with another man's wife, a corporate executive making plans to spray aluminum in the sky and poison a population, generals planning to use biological weapons of mass destruction. He's in pain over these crimes committed to mankind, His creation. He needs someone to respond to Him, someone who cares and loves Him and someone who has made Him their absolute priority over their own lives. Yes, indeed, you truly strengthen Him with your love. Out of this great sea of uncaring humanity, one has risen to kiss his Lord with his life. How He longs for that. Set aside the time of day when you are freshest. That might mean going to bed at 9 p.m. and getting up in the early quiet hours in the morning while the rest of the world is still asleep. Five a.m. is a very good time, 4:30 is even better. It depends on your family's work and school schedule. Plan on spending an hour and a half in His presence. That's a very nice portion of time. A lot can get done. Part of it is going to be in worship, part of it will be in repentance, and part will be getting instructed and healed by Him, resting in Him. For me a good cup of coffee, a stimulant is very important. My metabolism needs a morning kick but if you can be alert and reeling on your toes without it, then great. Basically, you pick a chapter of the Bible, pick it up everyday and read it until you feel something on one line or with one word. This is called a Rhema. That is an anointed word just for you. The Lord will meet you more than halfway to cultivate a listening heart as you begin this journey. He directs us to the things that are timely and necessary for us. When we choose our own Bible study we tend to go to what we like or what interests us. I prefer a more reliable way, where I know the Holy Spirit is in charge. You can ask for a chapter or fresh manna to be shown to you. You can pray, "Lord, please lead me today. What would you have me read?" Believe that He will answer that prayer. Open your Bible and begin to read until you feel Him quicken something to you. Yes, I know there are many people who will ridicule this method. Remember, we are kings and priests and are anointed to hear the voice of God. Drawing lots was a similar method that was used in Scripture to find things out. They gave God the space to make the decision and to speak. It's been used for a long time in Scripture. When choosing the replacement for Judas, they drew lots. And that's how they found out that Jonah was the reason for why the ship was going down. It works. Let the scoffers laugh all they want but the Lord said, "Truly I tell you lest you change and become like little children, you will never enter the Kingdom of heaven (Matthew 18:3)." At the point the Holy Spirit quickens a line of Scripture, stop and ponder what He is saying. Lock it away in your heart. Go over and over it in your mind and look at all the different ways it applies to you and then rest in that Word. Tuck it away, but keep it in mind, because something will come up that day that involves that very Word. It may be a confirmation of what you were thinking about, or a warning not to fall into temptation because the enemy set a trap for you, or it may be a Word of love that will reach down deeply and will bring you to tears. (He especially does this when I'm under conviction and I'm almost afraid to go to Him.) He sends me a heart in my coffee, a heart shaped rock, or a cloud. There are so many different love letters He scatters throughout our day if only we will stop, look, and listen, and pay attention with the expectation that He is speaking to us all day long. He is looking for us to acknowledge that. If we look, we'll see that He never ceases to encourage us and He is reminding us that He is walking with us through our day. One book I love to use, as a surgeon uses a scalpel, is Imitation of Christ by Thomas A. Kempis. Rarely does this book fail to speak to my heart. I go to this book when I want to know, "Lord, where am I at with you? Am I pleasing to you or are there some things you would love for me to take a look at?" Once I'm convicted of something, it's all I can do to repent of it and acknowledge deeply my fault and ask for the grace to overcome it. He is so taken to a soul that is contrite. The Scriptures even say, "The sacrifices of God are a broken spirit, a broken and a contrite heart, Oh God you will not despise (Psalm 51:15)." Just as we rush to forgive our children when they confess a fault with true contrition so the Lord rushes to comfort and sustain us. Now we're ready to receive the graces necessary to change our ways. Very often this process brings me into the sensible presence of Jesus: seeing, feeling, hearing Him just as He promised us in Proverbs 8:17, "I love those who love Me and those who seek Me find Me." In John 14:23 He says, "Anyone who loves Me will obey my teaching. My Father will love them and we will come to them and make our home with them." And in Matthew 5:8 "Blessed are the pure of heart for they shall see God." That's what this is really all about, it's purifying our hearts. We can see Him and the purer our hearts and our motives become, the clearer the vision will be of His face. You may find that journaling will bring you in that sensible presence. As you write your thoughts and prayers, asking Him for forgiveness, He may quicken a Scripture verse to you or even to your heart. Don't be afraid to go with what you hear and write it down. That's how I began this journey and many others have successfully begun the same way. The Lord is profoundly grateful for the soul committing to the scalpel of righteousness and a sincere desire to be formed and pleasing to Him. So many are oblivious to the heart of God. So many ignore Jesus. When He finds just one that truly cares, He is eternally grateful and showers that soul with marks of affection. We can't accomplish this alone. Sooner or later we must let Him carry us. All He wants is our consent and our sincere efforts to cooperate with Him. When we've been dodging certain things in our lives and we know we need to change something using the scalpel, The Imitation of Christ is very comforting. It really highlights the very thing that God wants to address. He'll never bring something up that you can't handle. Grace will always be there or He wouldn't bring it up. Not only that, but things must be addressed in a certain order. If we try to do the sanctifying by ourselves, tackling what we think needs changing - look out. When the Lord Jesus leads us into changing things, they can change - far less painfully, I might add. He's well aware of what needs to go first, and when we turn ourselves over to His leadership, He accomplishes wonders. So, this is one method He has led me to use. The other is to enter into His gates with thanksgiving and praise. There are many fine, anointed musicians to draw from. Playing this music, even with headphones, and worshipping is very effective. He loves our worship. I recount all the good things He has done for me during worship with music. There comes a time (for those of you who are athletic), it's like a runner's high - except it's God's high. You can continue to worship, or if led to do so, stop and enter into that quiet place and rest in the Glory of God. He may approach you, hold you, kiss your forehead, dance with you, sit with you and want to talk. Oh, He is so approachable and human in His ways of being with us! I'll tell you right now, He loves to dance and He loves to hold His bride and He'll even transform her. You'll see yourself wearing a wedding dress or an evening gown and your hair done up. There're been times when the color of my dress reflects what kind of thing is happening in my life. If it's a trial, then it's purple; if it's a celebration, then it's peach or if it's bridal, then it's white. He's amazing that way how He communicates with colors. Yes, He loves to shower gifts on His Bride. And for the men, it is not feminine to see yourself as His Bride. This is truly your identity. God is the Creator and we are the receiver. There is a feminine aspect, but not in the sense that is sinful or sexual at all. It's a mystery guys. Leave a tender moment alone, okay? My husband is not feminine. He spent his younger days fishing and hunting on the Bayou in Louisiana. He is very masculine but he has seen himself in the spirit as the Bride of Christ. In Chronicles of the Bride, a book that is on our website, you can read about his experiences. They are pretty amazing. This kind of intimacy usually begins through the eye of the imagination or at least that's our take on it. In reality, it is going on - what you think you are imagining, is the Lord taking you by the hand and drawing you into His reality. Go with it. Would He give you a snake if you asked for a fish? He is protecting that time and keeping the familiar spirits out of it. As you begin this kind of relationship with the Lord He will protect this time. Being close to Him in this way is so healing. He knows your pain. You're an absolute open book to Him and He wants to comfort you so let Him. When you walk out of this kind of prayer you are equipped to be an ambassador of love and to comfort others. You can't give what you don't have. This is preeminently time set aside for your equipping and your healing. As time goes by, you'll begin to gain confidence that Jesus is truly with you. This is not a phantom or a familiar spirit - this is God. At the same time, He will draw attention to the necessity of humility. Those who are gifted with this kind of relationship will be broken many, many, many times in order to safeguard their gift. Pride enters in so easily. Don't be afraid, it gets better and better. Don't be afraid to go to Him when you've blown it. This is a little secret when I've really blown it: it's because He, through His grace, let me fall. Why? I was getting proud, self-satisfied and even reading my own press. Because He loves me, He withdrew my strength and let me fall flat on my face. Now He's waiting for me to come to Him for healing. I might be running around the house nesting, which is what women might do when we're upset. He's so sweet and so faithful, gentle, and honest. Eventually He draws me back in so I can confess my fault. I love that song by Kari Jobe "You Were For Me" and in it she said, "I know that You were for me and I know You will not forsake me in my weaknesses." That's so true. Speaking of Kari from Gateway Worship I have found some musicians whom I recognize an extraordinary anointing. Kari is one, Terry MacAlmon and his songs I Came To Worship You, Glory of Your Presence, I Will Never Let Go. Jessica Ketola and her song Here In Your Presence, Charlotte Laystrom and her song It's All About You. Christ for the Nations, Blessed Hope Chapel, and Hillsong Music. Here are some very powerful and transforming songs by Kari: "My Beloved", "Revelation Song", "Beautiful", and "The More I Seek You". 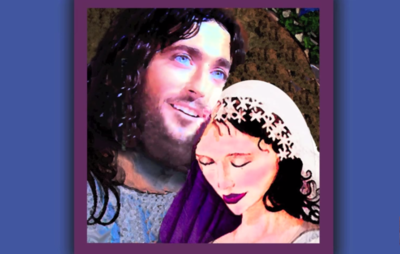 We also have a "Song of Songs" download on our website that is free to download. These songs are just suggestions, but I must say this is not about taste in music - it's about the anointing. The anointing brings you into the Holy of Holies. These musicians sing to Jesus. They are obviously very intimate with Him or they couldn't bring you into His presence. Songs about Jesus are nice to listen to, but when you want to connect with Him, in my experience, there is no better way: either to start out with deep repentance or praise and worship. On that note, I never use these anointed songs for background music or for casual listening. They are sacred to me and I use them just for our very own intimate time together. I hope this helps all of you who have been writing to me and asking for direction in this. I know many of you have already been in this place for years, but I'm addressing this for the newer ones who want to go deeper into a real, sensible relationship with Jesus. Don't be surprised if God the Father and the Holy Spirit show up, too. The three are one. Just one last thing I want to say. Some people think you can't see or hear from God, but that is contrary to the Scriptures. The Lord has made that known in His Scriptures. I just quoted three earlier for you, but there are so many more places in His Word where He has promised that intimate relationship with us. Every time you pray the Lord's prayer it's powerful because it's the prayer that Jesus Himself has taught us, "Thy kingdom come thy will be done on Earth as it is in Heaven (Matthew 6:9-13)." In Heaven you are going to see, hear, and speak to Jesus and the Father and the Holy Spirit. There's going to be no separation any longer. The veil will be removed. Remember that, as the enemy tries to hit you with skepticism and unbelief. This is scriptural and it is promised to us now. It is necessary for us. That's why Satan hates it so much. It's absolutely necessary for us to minister the love of God to other people and for us to enter into this and to overcome our faults as well. God bless you and hope to see you again soon. Thanks so much for listening.